“I think it’s my turn now. We need a good solid bread recipe” Mouse remarked, after she had tried all the recipes with just water, flour and some sort of fat, but no leavening agent. “Do you have a bread making machine?” Nitpicker asked. “I don’t need one.” Mouse replied proudly. “I am a purist. 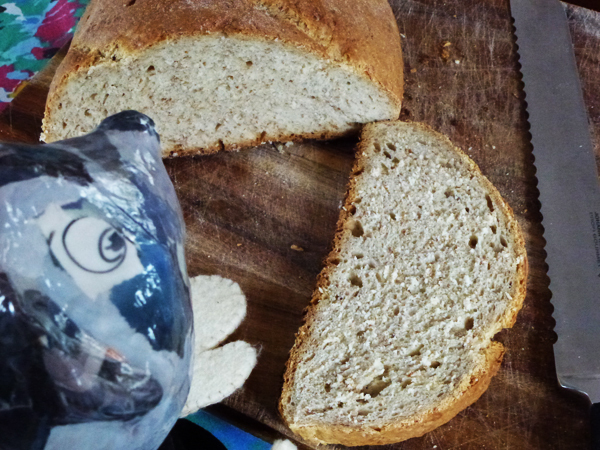 I love kneading the dough.” Mouse is indeed constantly baking bread, just in case visitors drop by. As she never knows how much she will need, she usually bakes two loaves. One goes in the freezer and the other one stays in the bread box to be eaten. When the first one is almost finished she gets the other one out of the freezer and by the time it is required, it will be defrosted. Sometimes she bakes three times a week. But it’s not really a big deal as the dough doesn’t need to be handled much. It mainly sits around rising and Mouse can do other things in the meantime. “So what do I have to watch out for when you can alter the flour as one pleases and add more stuff?” asked Nitpicker, who really feels unsure when instructions are too vague. “You need to have a good amount of glutenous flour, ie. white flour or whole meal flour, rye flour, spelt or barley. Gluten has a bad reputation but it helps the dough to rise, and gives it shape and a chewy texture. So don’t replace all the flour with gluten free types, though you can add some, for example buckwheat flour. “And then you have to give it time to rise. Please also be aware that your yeast might be different from the brand I use and might behave differently. For example, some dry yeasts can be mixed with the flour and you don’t need to slosh it up before you knead your dough. The brand I use doesn’t contain anything except dried active yeast and salt and I definitely get the best results when I allow it to foam in liquid first. The same company that produces my yeast puts out a special yeast for bread making and this one also contains wheat flour, emulsifiers (481, 472e), flour treatment agent (ascorbic acid), sugar, vegetable oil and enzymes, as well as yeast. Personally, I am happy with my bread and others love it too, so I don’t see the need to add all that stuff to it. I recommend you try the recipe by the book and if the result isn’t quite what you expect, make some slight changes next time. If the final product clearly tastes yeasty, use less yeast next time. If it doesn’t rise much, use more. But don’t give up. And though you might not believe it, it also mightn’t have worked perfectly just because you baked on a very humid day. 5 cups of white flour and 2 cups of whole meal flour, 2 teaspoons of dry yeast, approximately 3 cups of water, salt (optional). Water to brush on the loaves. Note: the proportions of the two types of flour are not that important as long as they combine to 7 cups. Use more whole meal for a heavier bread and more white flour for a lighter one. Combine the two flours in a large bowl and mix thoroughly with a fork. Make a well in the middle and add 1 cup of lukewarm water and the yeast. Let sit for 10 minutes until the yeast looks like sloshy foam. Then mix water and flour together and add the rest of the water. Transfer to a flat surface and knead throroughly for 5 to 10 minutes. I quite enjoy the kneading process. It can be very therapeutic when you’ve had a stressful day. Place the dough back in the bowl. Cover with a clean tea towel and let it sit in a warm place. The dough will rise to double its size, so it is important you have a big enough bowl. Let it sit for roughly an hour or longer if you want. You can even leave it over night and bake in the morning. Nothing is as nice as fresh bread, still warm from the oven. Take the dough out of the bowl and knead again. Add the salt now, if you want to add salt. Sprinkle flour on a baking tray. Divide the dough into two loaves and place on the baking tray. They will fit side by side on one tray. Let the loaves rise for another 10-15 Minutes until they have has visibly enlarged. The oven should have heated up to the right temperature during this time. Brush the loaves with water (this will give the bread a crust). Cut the surface diagonally with a sharp knife. I also place a water-filled ramikin on the baking tray for extra crunchiness. What inspired you to combine eery pruppets and bread? Interesting concept.